ChemoCentryx is having an incredible day in the market today, and for good reason. Recent information with regard to insider buying is sparking interest among the investing community. Today, we’ll talk about the inside buying we’re seeing, why it matters, how the market is reacting to the news, and what I’m expecting to see from CCXI moving forward. Thomas A. Edwards – Just a couple of days ago, we saw one of the largest moves from a CCXI insider. Director, Thomas A. Edwards made the decision to buy 25,000 shares of the company in a deal worth $101,213. This brings his total stake in the company to 41,977 shares, meaning his recent purchase increased his stake by 147.26%. Geoffrey M. Parker – Geoffrey M. Parker has been incredibly active with purchasing CCXI as well. In fact, on May 13th, Parker purchased 40,000 shares at a total value of $161,388. On top of that, he made a purchase of 20,000 shares in January with a total value of $92,512. As investors, we make decisions based on the information that is available to us. This information includes news releases and generally outdated financial statements. However, the insiders know the inner workings of the company. They know exactly what’s going on, and when things are going good, they tend to purchase shares. Of course, when the business doesn’t seem to be doing well, insiders tend to sell shares. So, it’s important for investors to follow insider activity. In this particular case, the insider activity at ChemoCentryx seems to be a great sign. First and foremost, there’s more than one insider that is making large purchases. That’s a good sign. That, in combination with the fact that these insiders are more than doubling their stake in the company is a signal of something positive to come. Moving forward, I have an overwhelmingly bullish opinion of what we can expect to see from CCXI. 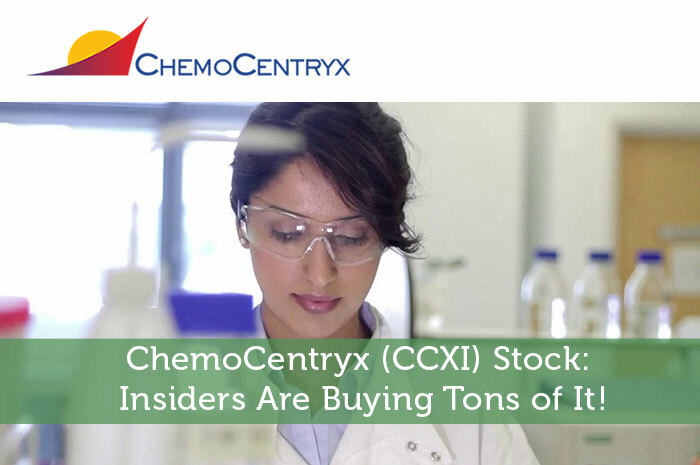 First and foremost, as mentioned above, when insiders are buying a stock, chances are that something big is going to happen, sending the stock upward in value; and insiders are all over ChemoCentryx. However, that’s not the only reason that I maintain a bullish opinion with regard to what we can expect to see. The reality is that CCXI has quite a bit going for it at the moment. Recently, the company signed an agreement with Vifor Pharma under which Vifor will pay CXI an upfront payment of $60 million in cash and $25 million as an equity investment. In return, Vifor will have the rights to commercialize CCX168. Of course, there are regulatory, development, and commercialization based milestones as well as double-digit royalties involved as well. With this agreement in place, it seems as though ChemoCentryx is on track for incredible gains to come! Where do you think CCXI is headed moving forward and why? Let us know your opinion in the comments below! ChemoCentryx (CCXI) Stock: Insiders Are Buying Tons of It!